I have a Pace Arrow with a Chevy 454 engine. I purchased a Prowatt 300 inverter and plugged it into the cigarette lighter. The Prowatt works fine until I start the engine. It then faults like it is in an overcharge condition and quits supplying power. If I turn the engine off, the Prowatt will resume normal operation and work fine. I tried it on the lighter plug in the back bedroom with the same result. I hardwired it directly into each one of the batteries, Starting, Coach and then Aux. Same thing happens! No matter what I try, the Prowatt will always shut itself down when I start my engine. I have tried every test imaginable, but it simply will not operate with the engine running. But when I plug it into my 2000 Ford F-250, it works perfectly regardless if the engine is running or not. I have called Prowatt and they say the unit is not faulty, but instead is detecting an overcharging condition when my RV engine is turned on. Please help? Why does the Prowatt keep shutting off? Am I producing to much current? Bob, given that the unit works correctly in your F-250 and also when the RV engine is not running, the inverter is obviously in working order. 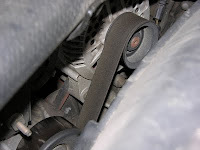 The fault only occurring when the engine is started and running, leads me to question the alternator. Perhaps the alternator is putting out higher than acceptable DC voltage when running. If I’m not mistaken the Prowatt 300 shuts down around 15.0 to 15.5-volts DC. A voltage exceeding this is possible with some alternators, especially ones with poor or nonexistent output regulation. Voltage this high is not good for batteries or other DC appliances. If there have been other problems in these areas, such as off-gassing at any of the batteries, it would be confirmation of alternator regulation trouble. I would recommend you measure the voltage at each location before and after the engine is started, looking for high voltage situations. It would also be nice to capture the voltage history over time during engine start up, but this is only possible with sophisticated scopes which are not usually found in RV shops. Hopefully the voltage readings alone will give some indication as to the source of the problem. Alternator output in the form of ripple voltage is also hard to see with a common VOM (volt-ohmmeter), but could also be the cause of the fault in the inverter. There just may also be a voltage spike that is causing the inverter to shut down. The spike may only be a temporary phenomenon existing only during engine start up. If this is the case, resetting the inverter by turning the switch off for a few seconds and then back on, should help. The most obvious solution is to improve alternator output voltage regulation by adding an alternator regulator, such as the Xantrex Alternator Regulator (XAR) or by upgrading the entire alternator to a better regulated model. Any new alternator should be of the high output variety. The added benefit of this will be cleaner and faster battery charging with longer battery lifetimes. This is my best guess without the benefit of checking the system with a scope.